That thick red line is the United States. For the record, we’re beating Mexico, Turkey, and Chile. But every other OECD country – every single other one listed there – has figured this out. I’ve been spending a lot of time recently talking about the cost and quality of the health care system, but let’s not forget access. We’re terrible. There are so many countries bunched near 100% that you can’t see them all; picking out the very few that aren’t is easy. Say what you will about the PPACA, but it was designed primarily to get at this issue. It’s not perfect, and it won’t get us to 100% insured, but it will get us closer. Our goal at this point should be to keep pushing to get us up with everyone else, not to return us to this. *This is from OECD data. Given the discord in D.C., do you see any way for individual states to provide a more European- style system? Some U.S. states are larger than European countries. My concern is that you’ll never get Republicans to agree to a federal system, but they might allow States to attempt it. Presumably, it would catch on. 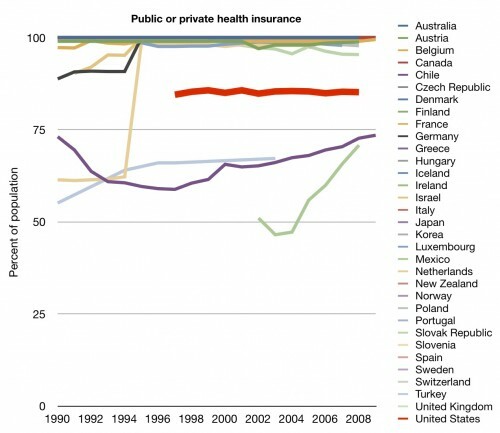 Also, do you have graphs which show a state-by-state comparison of coverage? @Richard – Visit statehealthfacts.org . It’s got loads of maps and data on coverage and related matters. Most Republican voters don’t even know why they are against health care reform — the popular conservative positions spouted on Fox News and AM radio do all the thinking for them. If they were truly ideologically conservative, then they would be making the same public case for repealing Medicare, Medicaid, and Social Security. Our president has a really poor marketing team, and perception is everything. The good news is that the likely poor outcome for democrats next Tuesday will actually set the stage for a better defense of health care reform (too long to explain here). Most people do not need health insurance (it cost them more than it pays out and costs them late). People can mostly amortize even very large medical bills after they happen. It also addresses the problem of doctors attempting care on weak patients who are sure to die. Having a And if fewer people had insurance it would be even less needed. Here is my proposal on health Ins. The state would provide insurance to all Americans but the annual deductible would be equal to the family’s trailing year adjusted income minus the poverty line income (say $25,000 for a family of 4) + $300. So a family of 4 with a trailing year adjusted income of $30,000 would have a deductible of $5,300. A family of 4 with a trailing year adjusted income of $80,000 would have a deductible of $55,300. Middle class and rich people could fill the gap with private supplemental insurance but this should be full taxed…. Also, two of the three countries that have a lower coverage rate than we do are clearly improving. We’re flat. Which country has the spike in improvement of coverage starting around 1994? I can’t match the color precisely to the key. I think other website proprietors should take this site as an model, very clean and wonderful user genial style and design, as well as the content.You’re an expert in this topic!